The 3D Systems 3DMe™ Photobooth is a completely automated, self-service 3DMe photo kiosk and E-Commerce system. The 3DMe Photobooth allows customers to scan their face, personalize their model, and pay for their product. The fully-customized 3D printed model is shipped to them directly from 3D Systems in several weeks time. Designed for retail stores, malls, theatres, and special events, the 3DMe Photobooth offers a high return on investment in a tiny footprint. Fully E-Commerce enabled for US and international placements. Completely automated operation, no associate required. 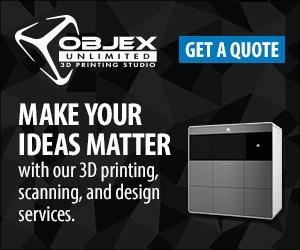 Once you purchase your 3DMe Photobooth, Objex Unlimited will take care of both the set-up and servicing of the booth in your retail space. Every quarter, you are mailed a cheque directly from 3D Systems for your figurine sales. You’ll earn 18% off every sale made through the 3DMe Photobooth… simply from having it in your retail space.